There are a few things everyone knows about unicorns. For instance, they can heal wounds with their horns and are attracted to high mountain lakes where they can peer at their mystical reflection with ease. Another unicorn fact that may or may not surprise you? They are master nappers. A unicorn can easily doze overlooking a windblown cliff while a young maiden that he just saved from a dragon summons her bird friends from the comfort of his back. If unicorns lived in the city, they'd be the type to close their eyes on the subway and wake up just in time for their stop. Why are they so good at napping? Because unicorns, like their less mystical horse cousins, can sleep standing up. And that, friends, is why they are always well rested and ready to party. You'll feel like a snooze wizard yourself when you're ready to nap with this sleep mask. The polyester material makes it as soft as silk. There's no need to worry about messing up your mane, the elastic band simply stretches around your head leaving all sorts of hairstyles alone. The funny print on the front lets people know you're gearing up to have a good time so they're sure to leave you alone! So if you're going on a road trip and you want to nap like these legendary beasts, you're going to need a good sleeping mask. From planes to family car rides, you'll find that it constantly comes in handy. 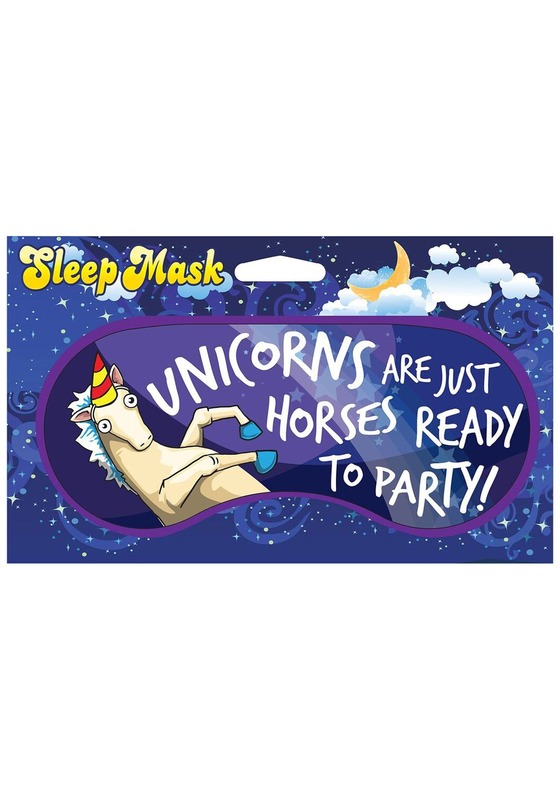 And when it's time to get out and explore, you'll emerge fresh and ready to party with all the get-up-and-go that unicorns have!